I LOVE the cover, and can’t wait to read Braced! What a wonderful way to build on your own experience, Alyson :)!!! Wow! This cover looks awesome and the story seems so inspirational. I can’t wait to read it. Oh my gosh! The book looks amazing – and perfect cover!! Can’t wait to read it! This is awesome Alyson. Can’t wait to add it to my library! The cover looks unbelievably great!! Can’t wait to dig into what’s inside!! An amazing cover to match an even more AMAZING book. Can’t wait to get my copy next March!! Squeeee!!! It’s striking and beautiful! Congratulations, Alyson! Year old daughter and I cannot wait to get our hands on this book! I cannot wait for this book to come to stores! It will be perfect for my students! Super excited to read this one, recommend it teacher friends and I’m so proud (farklempt!)! I know many kids for whom this will be a meaningful read. Great cover! Looking forward to reading the book! At first glance the cover is undeniably beautiful, but if you take a closer look, the design is so smart. A much needed book with the perfect cover to help it get in the right hands. Mine for sure! Gorgeous and thoughtful. Can’t wait to read it. Congratulations! I am looking forward to reading this great book. So beautiful! Can’t wait to read this book! I am sure that this will be a must read for my patients with scoliosis! Amazing cover. Can’t wait to buy the book when it’s out! Very exciting. The cover is awesome! Congratulations! I will definitely recommend it to my patients with scoliosis! The cover looks amazing. Can’t wait to read the book! Love this cover! So excited! What a stunning cover! If only we could start reading what’s inside! Can’t wait for it to be published! So excited to share this with my goddaughter! Love it. Can’t wait to read it!!! love it!!! I can’t wait to get my hands on this and read!!! The cover of this book matches its author with beauty, grace and love. I believe that this book will be so important to this new generation of young women coming of age! I am full of pride in your accomplishment! Aesthetically beautiful and emotional cover. I can’t wait to read her story. I want to buy it now! The cover design is beautiful! Very excited for this book to release and cannot wait to share with my teacher friends for their students to read! I love the cover and really Looking forward to reading the book!! This book is so necessary! Beautiful cover art. I teach 6th and 7th grade English at Pike and live at Gov’s, so this is so exciting to me for many reasons, but I literally just had my 7th graders hand in a project yesterday on book covers! We do a unit on book covers and then they read a book of their choice and then critique its effectiveness. I would LOVE it if they could communicate with you next year about your book (and have some of them read it!). Congratulations! Fabulous cover, Alyson! I wish you much success with this title and all the books I know will be coming. Congratulations! Hi Alyson – so, so excited for you!! I’d love to connect with you and hear more! How can I get an ARC? and sharing it with my teacher friends. A beautiful cover to match a beautiful and inspiring journey told best by Alyson Gerber. I cannot wait to get my copy and to share Braced with all those who need a little inspiration, support and a great read! 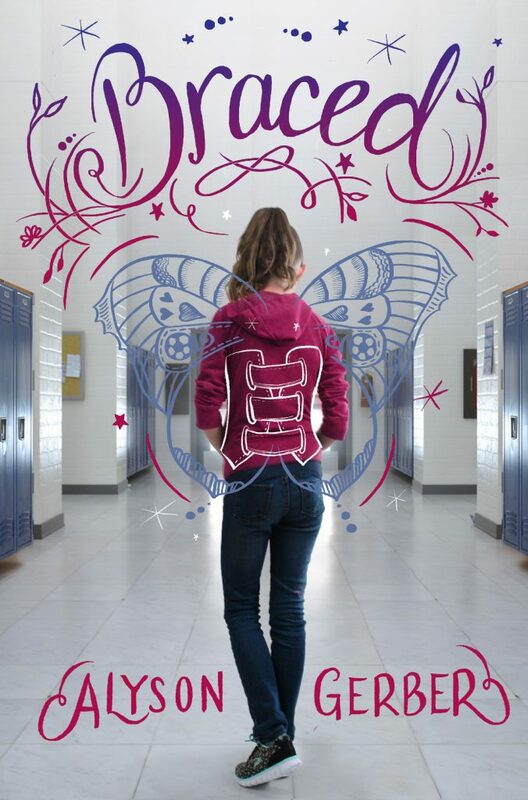 Finally, a book young adults with scoliosis can relate to and get excited about. I can’t wait! What a beautiful cover! As a teacher, I love books that directly relate to my students’ experiences. I know this book will touch so many people. Can’t wait to share it with my students! As an After School director – this is a must read!!! Thank goodness someone finally wrote this story- the cover is beautiful. So excited for this book! Everyone has a brace of some kind, great to know there are books out there to help young people navigate the difficult time of growing up. Cool cover! Such a great cover!! So excited for this book to come out. Absolutely love the cover design and I am sure the book is going to be amazing!! Can’t wait to read!!! Looks awesome! Can’t wait to buy this for my niece! Great Cover…much anticipation for the book! As someone who had mild scoliosis growing up, and who likes YA fiction, I can’t wait to read this story. Beautiful cover. Looking forward! I am so excited to share this book with my niece who has special needs. This is a rare and wonderful find! I had to wear a back brace when I was in middle school and I think this is a fantastic idea to help kids with scoliosis braces know they’re not alone. Thank you!